Cardace - 10mg is easily available via online pharmacy, drugstore, and medical supply store. What is The Generic Name of Cardace - 10mg? 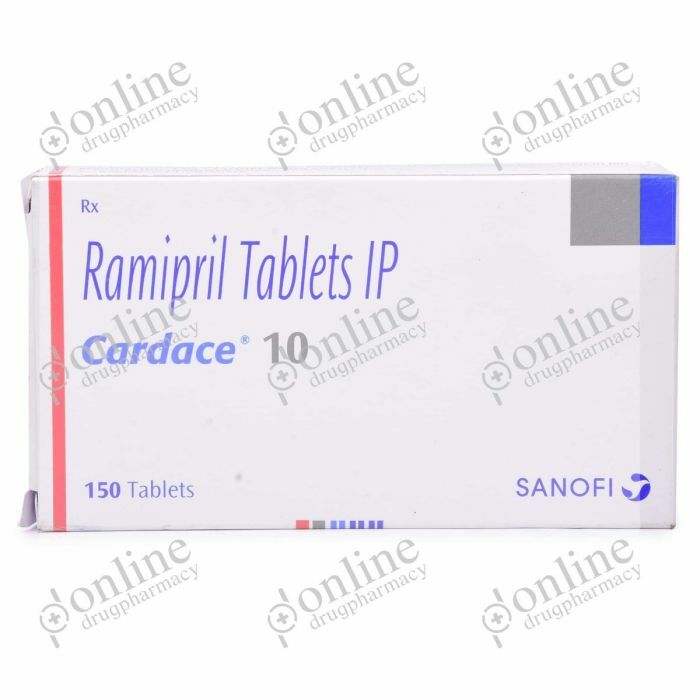 Ramipril is the generic name of the Cardace – 10mg, and it is produced by Sanofi India Ltd.
Cardace - 10mg is manufactured by Sanofi India Ltd in India and is available at all the leading online pharmacies, drug stores, and medical stores. Cardace- 10mg is available in varying strengths. How Cardace - 10mg (Ramipril) works? It is an ACE inhibitor. It works by relaxing the blood vessels and reducing stress on the heart so that blood flows more smoothly and the heart can pump blood more efficiently. It shows no interaction with other medicines that you’re taking. What should be avoided while using Cardace - 10mg (Ramipril)? ● Do not consume alcohol. It can interfere with the metabolism of the drug within the body. ● Using potassium supplements or salt substitutes. They can increase the blood pressure. ● These drugs can result in postural hypotension. Thus, avoid getting up too fast from a lying or sitting position. When not to use Cardace - 10mg (Ramipril)? 1. If you’re allergic to Ramipril drug or any other constituent present in Cardace 10mg. 2. If one is taking Aliskiren. ● If you are taking any other medication for any disease or disorder. ● If you have ever been diagnosed with liver or kidney problems. Cardace - 10 mg is available in varying strengths and at different doses. Consult a doctor for the appropriate dose. How much of Cardace - 10mg (Ramipril) to be used? Cardace 10mg is available in the form of tablets. The drug must be used as prescribed by the physician. How to use Cardace - 10mg (Ramipril)? ● One should wash and dry his/her hands properly before taking Cardace - 10mg. ● Use only on prescription from a registered medical practitioner. ● One should take Cardace - 10mg as long as directed by the physician. For how long should I continue using Cardace - 10mg? One should take Cardace - 10 mg as long as directed by the physician. What can happen due to the overdose of Cardace - 10mg? Due to an overdose of Cardace - 10 mg, you may feel extremely light-headedness, dizziness or fainting. Contact the doctor immediately or seek emergency medical treatment if such things happen in case of overdose. ● If one is suffering from bilateral renal artery stenosis. ● If one is suffering from a single kidney with unilateral renal artery stenosis. ● If one is suffering from aortic stenosis. Regular checking of blood sugar level. Regular monitor of white blood cells of the patient with vascular collagen disorder. Use Cardace - 10 mg as prescribed by the doctor to treat type 2 diabetes. ● Swallow Cardace - 10 mg as a whole. ● Do not break or chew it. ● Take Cardace - 10mg with or without food. To get the result, one can use Cardace - 10 mg in the range of 5-10 mg per day. This is not a substitution for any medical advice, so it will be better to contact the doctor for the appropriate dose according to the health condition.